Here are a few pictures of the Moon and Jupiter that I captured on Friday night/Saturday morning under some great seeing conditions – in fact the best seeing conditions I’ve seen all year. 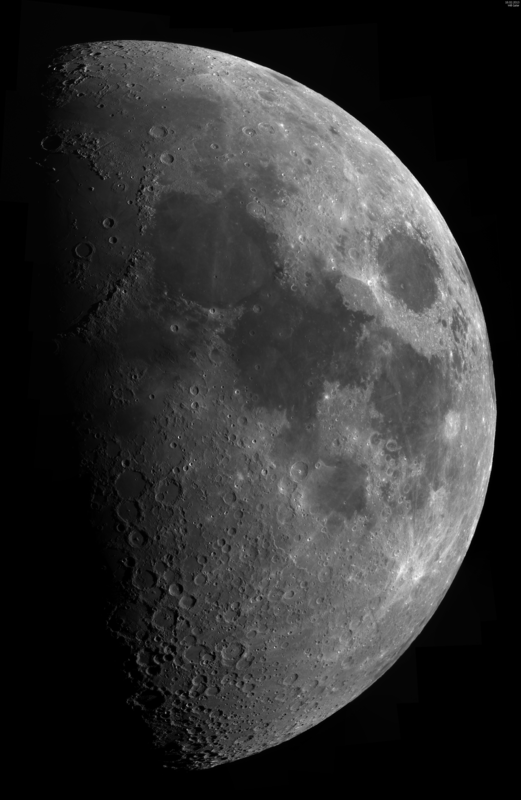 All of the images were taken with an 8-inch Schmidt-Cassegrain telescope, an Imaging Source DMK21AU618.AS CCD camera and a 2x Barlow lens. To create the colour Jupiter image I also used a set of Astronomik RGB filters and a 3x Barlow lens (I used the 3x Barlow for the Atlas/Hercules shot too). 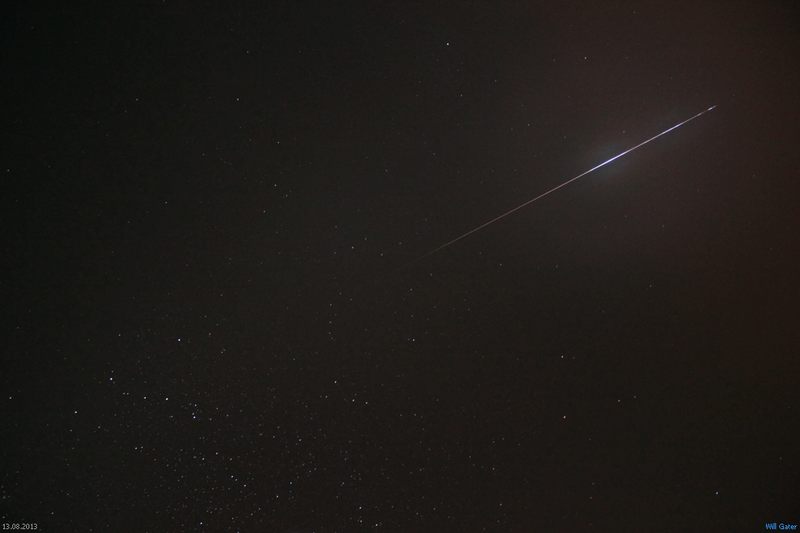 Last Saturday I headed up onto Dartmoor in the hope of seeing a few meteors from the Leonid meteor shower. 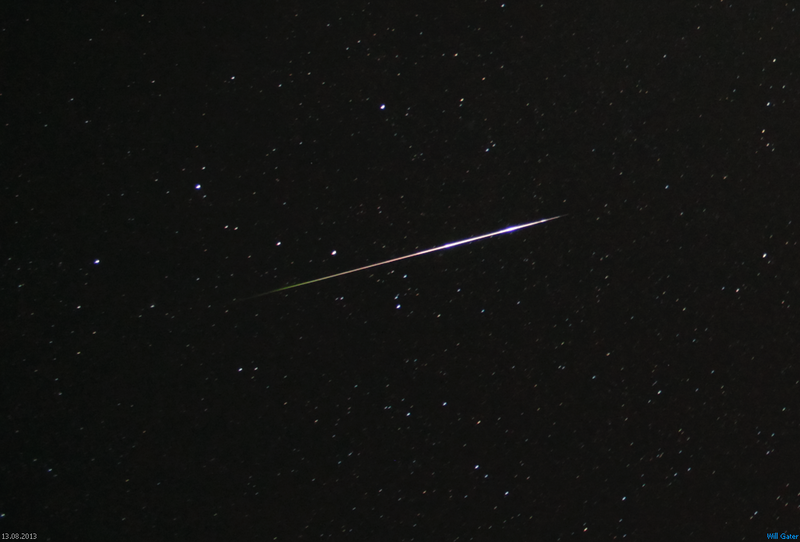 Even though I had clear, dark skies on my side, the Leonids put on a rather feeble display this year; in a 3-hour observing session I only saw four, though I did see around twenty respectable sporadic meteors. After a good few hours of trying (and failing) to catch one of the blighters on camera I gave up and decided to have a go at imaging some other targets. I couldn’t resist photographing the superb sight of Jupiter with the Hyades and Pleiades star clusters. The image above is a stack of six three-minute exposures taken at ISO 400. I used an unmodified Canon 550D DSLR and 90mm lens with an HEQ5 Pro mount (which was autoguided by a Sky-Watcher SynGuider attached to an 80mm refractor). The picture of the North America Nebula below was taken with the same setup, but it’s composed of about 30 minutes of exposures at IS0 400. With the awful weather we’ve had here in the UK this summer I’ve had hardly any astro images to share here on the blog. Thankfully, things seem to be improving* as we enter autumn. 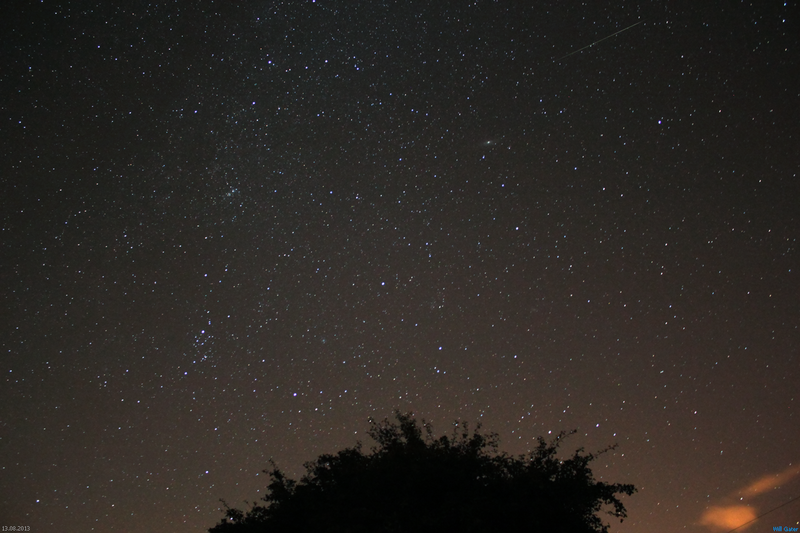 Here are a few shots I captured last weekend while camping in the Gower with my wife, Rose. We camped at Three Cliffs Bay on the south coast. It’s a beautiful part of Wales with clear views out over the Bristol Channel to the south — perfect for observing, low altitude, summer objects like the Lagoon Nebula and the many interesting star clusters in and around Sagittarius and Ophiuchus. The skies were wonderfully dark looking out over the Bristol Channel to the southwest; sadly the same can’t be said for the view looking east, towards Swansea and Port Talbot, where substantial light pollution masked everything but the brightest stars. Anyway, if you’d like to see some of the objects in these images yourself you’ve got a few weeks before they disappear into the twilight for a while — September’s Sky at Night Magazine has a great observing article on pages 32-37 to get you started. * I may regret writing that. A week ago I travelled to the Greek island of Kos to observe the 2012 transit of Venus – a rare celestial event where the planet Venus drifts in front of the Sun’s disc, as seen from Earth. The hotel where I stayed was located on the north-eastern end of Kos, close to the village of Psalidi. I had chosen this site for two main reasons. The first was its shoreline location and clear view to the northeast out over the Aegean Sea. Only the distant mountains of Turkey interrupted the horizon, but as they reached less than a degree above the horizon I knew they wouldn’t obscure much of the transit. Besides, when the Sun is that low down the distorting effects of the atmosphere are so great that getting a sharp view of the transit (when the Sun is barely a degree above the horizon) would be almost impossible. Although the transit would be well underway by the time the Sun rose from Kos, the island’s position on the Earth meant that around 2 hours of the transit would still be left to observe. And the Sun would reach an altitude of about 20 degrees, from Kos, before Venus moved off the solar disc. A view of the north-eastern horizon from my observing site near Psalidi. The second reason I chose Kos as my transit observing location was that the eastern end of the Mediterranean had the best weather prospects in Europe for the time of the transit. I later found out that I wasn’t the only one with the eastern Med in mind as an observing site, as several other astronomers — including well-known German astronomer Daniel Fischer — travelled to Rhodes. I was able to take two telescopes with me to Kos. The first was the de-mounted optical tube assembly from an ETX90EC with a Baader AstroSolar Safety Film solar filter. I have used this telescope on observing trips several times, including the 2006 total solar eclipse in Turkey, as its compact size is perfect for travelling. However this time because of hand luggage weight constraints I had to carefully pack it up and send it to Greece in my hold luggage. Unfortunately a quick star test on the night of my arrival in Kos showed that it had slipped slightly (but noticeably) out of collimation — so my transit images from the ETX OTA are not as sharp as they could be. The second scope I took with me was a Coronado PST. I carried this as hand luggage along with a DMK 21AU618.AS CCD camera and the Baader solar filter. 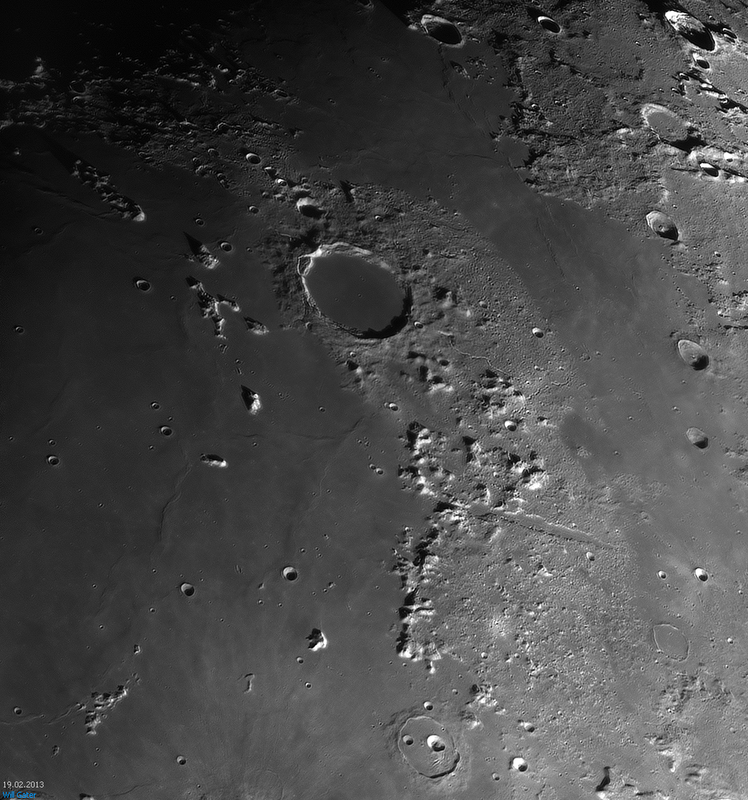 A test image captured with a static photo tripod a few days before the transit. Both telescopes were used, one at a time, with a heavy photographic tripod. Imaging the Sun with my Canon 550D DSLR and the ETX scope was a fairly easy affair — only single, short, exposures were needed. However the PST/DMK/static photo tripod setup presented a few imaging challenges. Namely, how to capture an AVI video through the DMK/PST without blurring the image or letting the Sun drift out of frame while the video was being captured. There was no way I would be able to take a tracking mount with me to Greece; so in the months leading up to the transit I practiced hand guiding the alt-azimuth controls of the photographic tripod so that the Sun stayed in frame, in roughly the same location. It was difficult to say the least, but it did work and Registax was able to process the videos without any ‘ghost’ images. Above is a test — hand tracked — PST image captured two days before the transit. Dawn breaks over Kos on the morning of the transit. The morning of the transit was clear, with only a few thin haze clouds hugging the horizon. Yet as the dawn began to break a few clouds started to bubble up over the coast of Turkey. One cloud in particular (seen in the image below) had me worried, as it was threatening to move right in front of where the rising Sun was about to appear. Thankfully though these clouds moved away — and some of the haze appeared to dissipate — a few minutes before the first rays of sunlight appeared over the mountains. The north-eastern horizon moments before sunrise. My first view of the transit was, as expected, heavily distorted by various atmospheric undulations. It was actually quite surreal to see the silhouette of Venus, through the eyepiece, being smeared up and down — as if someone was stretching and compressing the whole solar disc. The series of images on the left (click the thumbnail to get a bigger version) shows this effect clearly; they were taken just as the Sun was appearing over the distant Turkish mountains. As the Sun climbed higher in the sky the atmospheric distortion lessened and I was able to begin imaging the transit in earnest. Below are a few of the shots I was able to capture. Towards the end of the transit a large cumulus cloud bank formed to the southeast and began to slowly drift in the direction of the Sun. As Venus was moments away from slipping off the solar disc, the wispy edges of the cloud began to encroach onto the Sun until finally the transit was completely obscured. And so began the 105 year wait for the next time that Venus glides gracefully across the face of our star. One final note: throughout the transit I was using specialist solar filters to observe and photograph the Sun. Never point an unfiltered telescope, unfiltered pair of binoculars etc. at the Sun. You will damage your eyes and almost certainly blind yourself. If you want to observe the Sun only use specialist certified solar filters that have been fitted correctly (and thoroughly checked) and that have been purchased from a reputable astronomical supplier. Be sure to follow any usage instructions carefully. Finderscopes etc. should also be filtered or removed. It was hard to decide where on the Sun to look first yesterday with all the activity that was going on. AR1476 was, of course, taking centre stage but there were also numerous filaments scattered over the disc, while around the limb there were several impressive prominences. I managed to capture a few pictures of what was going on, but sadly the seeing conditions were poor and so the detail in the images isn’t very good. The picture above and the first two pictures below were taken with an Imaging Source DMK 21AU618.AS CCD camera (shooting at 60FPS), a 2x Barlow lens and a Coronado PST hydrogen-alpha filtered telescope. The last image was taken with the DMK 21AU618.AS on an ETX90EC OTA fitted with a white-light solar filter. A word of warning: never point an unfiltered telescope, unfiltered pair of binoculars etc. at the Sun. You will damage your eyes and almost certainly blind yourself. If you want to observe the Sun only use specialist certified solar filters that have been fitted correctly (and thoroughly checked) and that have been purchased from a reputable astronomical supplier. Be sure to follow any usage instructions carefully. Finderscopes etc. should also be filtered or removed.